The idea of a pilgrimage is powerful, and carries spiritual overtones, and I made one recently, with a good friend, to see work by Agnes Martin at the Tate Modern in London. That our destination was not a religious shrine but a gallery filled with paintings made the journey no less transfiguring. Agnes was born in Canada but is known as an American artist; the exhibit is at the Tate Modern in London, and it seemed particularly important to me that the pilgrims in this case--two American women, my friend and I--travel to see her in a country not our own. The paintings in the Tate exhibition are soaring, serene, floating, yet charged with energy. The canvases are large, some of them familiar to me for having seen them in other galleries, and I felt myself dissolve moving through the rooms. 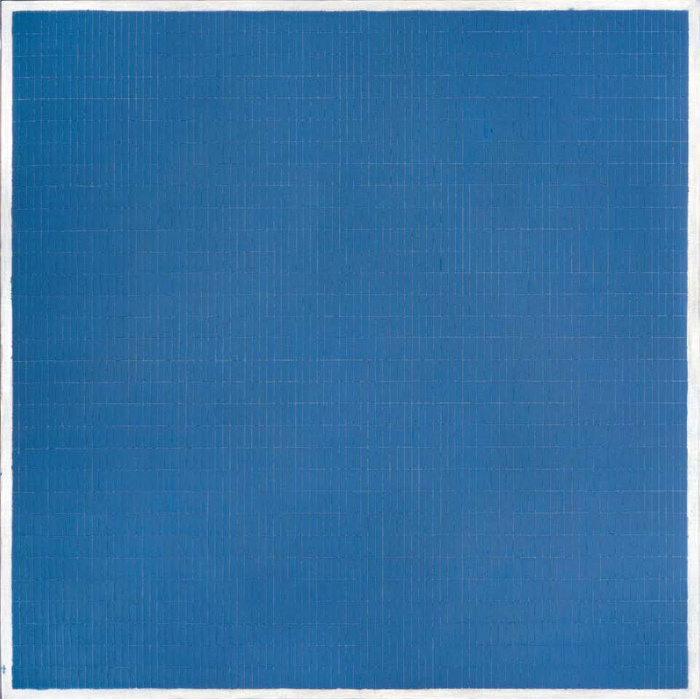 Agnes Martin sought perfection, and for all the apparent similarity in her canvases--in size, color, lines, in the rectilinear grid that had begun to appear in her work by 1958, in the parallel stripes that by the mid-1970's had mostly replaced the grid--it is their imperfections, the small variations, the thickened pencil lines--that pulled me into her life, gave me the sense of her doing this over and over, starting again, striving for an ideal, that filled me with emotion. Every painting touched me in a different way, but I had to return, after going through the exhibition once, to the center room where The Islands I-XII are installed. Twelve canvases, painted in shades of white, are displayed together, as Agnes intended them to be. The paintings are luminous. They are acrylic and graphic pencil on linen, and although from a distance they seem to be all-white, up close the delicate variations reveal themselves in thin white bands and thicker ones, pencil lines and brushstrokes. Agnes Martin Coenties Slip rooftop with Jack Youngerman and Ellsworth Kelly, 1957. Agnes is both local and boundary-less to me. She lived in New York City, as I do, and when I see the photo of her sitting on the rooftop at Coenties Slip, I imagine her needing and space and air--her painting are elemental--I think of her studio, a former sailmaker's loft in a small brick building by the South Street Seaport that still stands in the shadows of the financial district's towers--and wonder if the walls of both this city and the studio, despite the salt air and views of the East River, were closing in on her. She left, just as her reputation was soaring, and drove a pickup across the United States for over a year before finding her place in New Mexico. She sought, or was given, visions of beauty, happiness, purity, and joy. Before leaving New York she had hospitalizations at Bellevue, a diagnosis of paranoid schizophrenia. Those grids, meticulous works scored with intersecting lines, carefully drawn with pencil and ruler, convey to me wide open spaces. She said, "Finally, I got the grid, and it was what I wanted. Completely abstract. Absolutely no hint of any cause in this world." Once, after viewing some of her work at Dia: Beacon, I dreamed of her grid paintings as Saskatchewan: flat and rural, the province of her childhood, fields and farms scored by roads, fences, and rows of crops. In the Tate's short film Agnes Martin Road Trip, Agnes said, "You are what goes through your mind, whether you are aware of it or not. You know. But if you can become aware of it, and and if you then can try to express it, you are an artist." She has spoken of her mother, of her dark silences, of unhappiness. Childhood pain is the thorn in the paw of so many artists and writers, and we spend our lives trying to get it out. And maybe make things turn out differently, at least on the canvas or on the pages of a novel. Maybe she was purely abstract--the ultimate minimalist--but her titles are poignant, and when you think of what you've read about her childhood, heartbreaking--Happiness, Contentment, Happy Holiday, Innocent Love, Drift of Summer, Happy Valley. In the sixties, diagnoses of schizophrenia were handed out freely, a catchall for all kinds of psychiatric distress. Creative people found themselves labeled and locked up. In Agnes Martin: Paintings, Writings, Remembrances her friend and Pace Gallery owner Arne Glimcher writes of her voices. And supposedly an episode of her wandering Park Avenue in a fugue state landed her in Bellevue; but what young creative person living in New York hasn't found herself wandering some part of the city in a fugue state? I ask this in all sincerity. Night Sea 1963 Oil and gold leaf on canvas 183 x 183 cm 72 x 72"
I was first introduced to Agnes's work by a psychotherapist. A print of Night Sea hung in Susan's waiting room. Sitting there I would stare at it and get lost in the color blue, and the grid, and the fact it was Susan's. For me it was not Bellevue but McLean, not schizophrenia but depression, and--eventually--not New Mexico but California. Somehow Agnes and Susan and living in New York and leaving New York and emotion and the abstraction of search and perfection merged together in my own private dream world, and an obsession took hold. Obsession and pilgrimage are strong words and I'm not sure Agnes would like them applied in relation to her. But they are real to me, and I've taken trips to "visit" her, both lengthy and just around the corner, before this one. Walks through the city, uptown to the Pace Gallery for a 2004 exhibition, frequent wanderings around Coenties Slip and the Seaport, to New Mexico to view the light-scalded landscape that inspired her later years, to Saskatchewan to see grids written on the earth, up the Hudson River to Dia: Beacon; and I've mostly returned from my California sojourn to live within sight of Dia: Chelsea. I wanted to buy Agnes's Galisteo studio. It was for sale again, a few years after her death in 2004. The desire took me over for a long time, and I am afraid I nearly drove a New Mexico realtor crazy. The revelation came slowly, as many dream-killing realizations do, that the remodeling job done after her death, the fancy kitchen and other updates, would have wiped out the feeling of her living there, that I wasn't likely to find her ghost or any traces of her life left behind. They would have been curated away. I go to Coenties Slip on Sundays when Wall Street is empty. A new management company has just taken over the building where Agnes had her studio. Maybe I should be glad it still exists at all; it is part of the landmarked block where Fraunces Tavern stands (George Washington bade farewell to his officers there) and won't be torn down, but the old sailmakers' lofts are getting a re-do. The marketing website touts proximity to the South See Port (you read that right) and all major subway lines, and to granite tubs and rain showers. The rents are high. This is the way of New York. Where do young, or any, artists and writers go now? Agnes speaks about inspiration, of how thoughts and ideas can get in the way. Paradoxically, even as a writer of fiction, I find that true. My intuition always knows what to write, and one of the biggest challenges is getting out of its way. Out of my own way. Ideas take a back seat to character. If I start thinking I know what the character should do, instead of letting her determine her own course, I'm in trouble. The character needs space. Meditation helps. Emptying the mind of worry and the impulse to control helps. And seeing art, getting lost in it, helps. The character rules. "I paint with my back to the world," Agnes said. And she did, leaving New York City to live as a recluse in New Mexico. But when you view her work, you've been invited onto the mesa, and it's luminous. The exhibition will travel to the United States later this year. But I needed to see it in London.